It’s school holidays time and we know how to keep the young ones happy and get them involved in making something for them, with your help of course! As soon as you hear that 'I'm bored!'... get out the wooden boards ..and lets get building! For little boys and girls – there’s nothing like messing around with bits of wood! This is fairly easy to do, can be decorated with some great art of your children’s own choosing, can be made quite cheaply and they will get years of fun out of this. 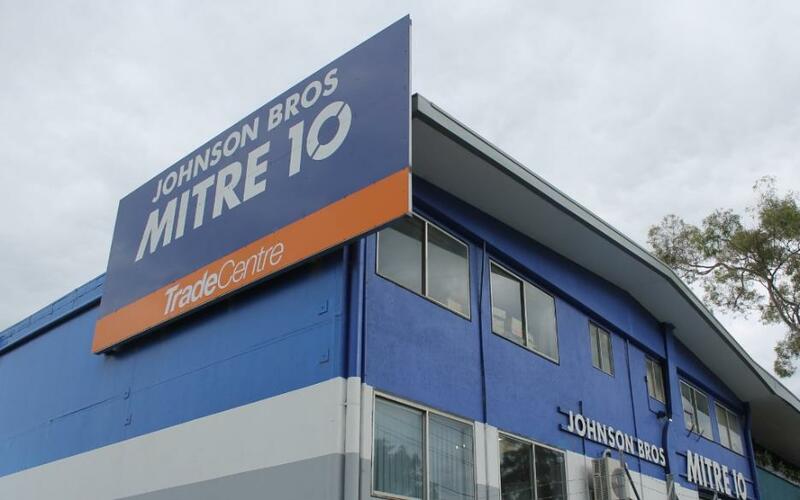 We recommend you ask the friendly trained staff at Johnson Brothers Mitre 10 for the best wood to use, something that will last in the great outdoors for a few years will work best. JBH Mitre 10 are also running their end of year sales at present too - so well worth having a look at what else you may need while in their stores. 1. Measure and cut the 38 mm × 184 mm, 3.04800 metres long board to 2.7432 metres with the circular saw. Repeat with the 38 mm × 89 mm, 3.04800 metres long board. Cut the remaining 38 mm × 184 mm x 1.8288 metres long into two .889 metres pieces. Sand all the edges smooth with the palm sander. 2. Measure and mark with a pencil 6.3500cm down from one edge on each .889 metres piece of wood. These pieces are the uprights that will be cemented into the ground. The measurements are for making the notches to hold the pipe. 3. Use the hole saw to make a 6.3500cm hole in each marked board. The marking made earlier shows where the bottom of the hole is. Use the jigsaw to cut out the remaining wood and create the notches. You will end up with a U-shaped opening on each board. 4. Find the center of the 38 mm × 89 mm board. Cut a U-shaped notch on this board using a 1 ¼ -inch hole saw, with the hole bottom being 3.17500 centimetres from the edge of the board. This board is the brace board for the seat of the seesaw. 5. Dig the holes for the uprights, using the post hole digger or shovel. Secure the uprights into place, with the notches facing each other, with the fast-drying cement. Leave 45.720cm of upright sticking out of the ground, with a spacing of 19.685cm between them. Make a line down the center of the 2.7432 metres board. Place a bead of construction adhesive along this line. Place the brace board on this line, with the notched side down, making a closed hole. Let dry. 6. Turn the board over so the seat side is facing up. Reinforce the bracing by inserting screws every six inches with the drill and a screw bit. Turn the board over again so the bracing is facing up. Slide the pipe through the notch and center it, with about 3.8100cm of overhang on each side. Secure the pipe into place with the pipe straps. 7. Make two marks at each end of the board, with the seat side facing up. These marks are 40.640cm from the end and 3.1750cm from each side. Drill out the marks with a drill bit that is slightly larger than the marine rope. This is for the handles. Thread the marine rope through the holes, as if you were sewing. Knot the open end. Pull 15.240cm of rope through the top to make the handle. Cut the rope and knot the end. Repeat for the other side. 8. Drill 63500cm holes in the uprights above the notches. These holes travel through the wider part of the board, and will need a long drill bit to make them. This is where the metal dowel will go to serve as a locking pin for the seesaw. 9. Place the seesaw seat board onto the notches of the uprights. Slide the metal dowel into place on each side. Ask your children to decorate the plank as suits them. You may want to apply a clear varnish to protect their art works. The seesaw is now ready to use! Please note that safety experts recommend small children are always supervised on all play equipment. - Children get endless fun with a seesaw. Here is one you can make easily. It is portable and the plank lifts off, so that the whole thing can be moved around. The base is made from timber, except for the centreboard on which the plank rides, which is cut from 1in hardwood. The base is made like a box, the idea being that you fill the box with sand to prevent it tipping. Be sure to get a sound piece of timber for the plank. Two cleats (wooden strips)screwed in the middle on one side provide a guide channel, so that the plank will rest on the base without clipping. The channel is 1 ½ inches wide. Round the ends of the plank, then sandpaper It smooth to prevent splinters. The sketch shows the construction of the base ' with one side removed to make the details clear.